The last time on the ice? Today, February 24th I headed out to Rock Creek with David Bowles, Don Henry and Mark Anderson. We all met after lunch in hope to duplicate what David and I did last weekend, which was an amazing day of big gills and a few big crappies too. The weather was absolutely perfect today, no coat was needed for most of the day, it was so nice to be outside and feel the sun once again. We caught a lot of fish as a group, but the size was a bit of a disappointment. Today, the big ones were not present, but as a group we caught just about every species that swims in the lake. Largemouth bass, bluegill, white crappie, black crappie, green sunfish, catfish, bullhead, and walleye. Eight species in one day, that is pretty neat! It could have been my last day on the ice for the year, and if it was the last day, then it was a good one. If I get the chance to go again, then I hope it is good too. A big thanks to all the guys that made it out on the ice with me this year. Many memories were made, and some huge fish catches recorded too. The past two weekends I have spent two days and about 10 hours ice fishing at Rock Creek Lake. I have literally seen the lake start to change into open water. This past Sunday, David Bowles and I ventured to "The Rock" for a Sunday morning trip. We fished the deep basin area, a place that I have done well in all year long down there. It was no different, schools of fish swimming by, and we were there to intercept them and bring them up to the ice. 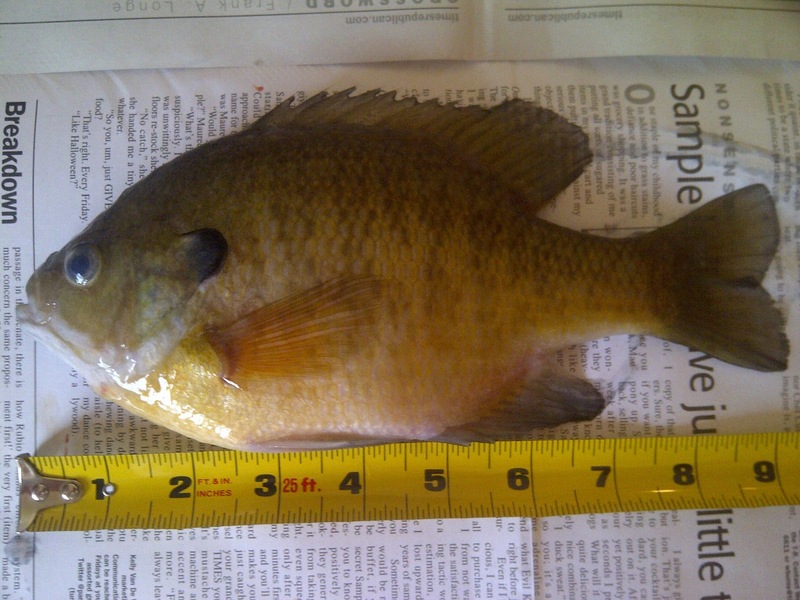 This past Sunday, we caught dozens of bluegills and crappies, probably about 80% of them were bluegills. David was bound and determined to "Take some meat home", and he did, about 35 panfish for a large family meal or two. 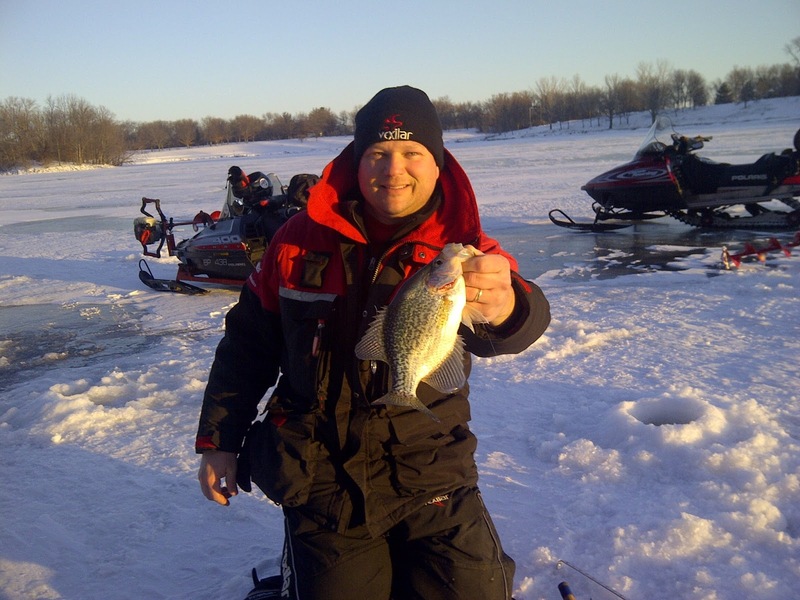 The fishing this day was typical late season ice fishing, deep basin fishing. To my knowledge, these fish at Rock Creek, although the lake was about 20% open water, have NOT gone to their ice-out areas. These ice-out areas are typically up shallower than they have been in the late ice fishing season. The panfish at Rock Creek are the best they have been since I moved to the area in 1999. The bluegills have length, and the crappies are nothing to shy away from. 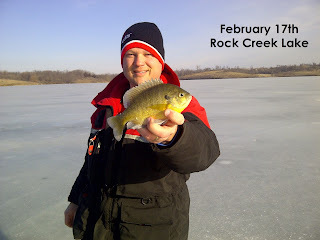 I love Rock Creek Lake, and my ice fishing friends and I have had some awesome days fishing that lake through the ice. Perhaps Mother Nature will allow me a few more hours on the lake before that beautiful ice melts. 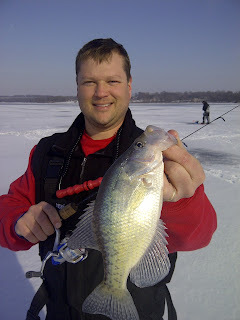 The only crappie of the day, but a real nice one. I was in need of some "therapy" today, as Friday was filled with teacher meetings, and then five hours of grad classes at night. That was followed up with the same grad class in West Des Moines from 8am-5pm on Saturday. Needless to say I was itching for some time on the ice. So up and at them at 5:30am to meet up with David Bowles to hit Hickory Grove Lake. With both of our snowmobiles on the trailer, two augers and all our gear, we were ready for the challenge that hickory Grove had for us. Recent reports have all been very negative, with little fishing happening and no solid fishing reports. We wanted the challenge, and took it. ﻿﻿We covered 6 different areas of the lakes, varying from 13- 30 feet of water. Most had brushpiles present, while others were located near drop-offs. "Farm pond quality, in a public lake"
We did not "kill" the fish this day, but our hard work and perseverance led us to a good morning on the ice. We ended up only catching about 15 fish in 4 hours of fishing, with a lot of time searching and drilling about 60-70 holes. All areas that we fished had fish present, however we only caught fish in 3 of the 6 areas, with one area being best with about 8 bluegills being caught. Again, we didn't catch a lot of fish, but eh fish that we did catch were nice quality panfish. The lone crappie was at ten inches, and about 10 of the bluegills were 8-9.5 inches long, real nice quality for a public lake. A great morning on the ice, I just hope the weather the stays cold, so my friends and I can enjoy a few more days on the ice.